This article is about the Cuban singer of Salsa music. For Spanish-language telenovela about her life, see Celia (telenovela). Úrsula Hilaria Celia de la Caridad Cruz Alfonso, also known by her stage name Celia Cruz (October 21, 1925 – July 16, 2003), was a Cuban singer of Latin music. The most popular Latin artist of the 20th century, she earned twenty-three gold albums and was a recipient of the National Medal of Arts. She was renowned internationally as the "Queen of Salsa", "La Guarachera de Cuba", as well as The Queen of Latin Music. She spent much of her career working in the United States and several Latin American countries. Leila Cobo of Billboard Magazine once said "Cruz is indisputably the best known and most influential female figure in the history of Cuban and Latin music". Úrsula Hilaria Celia de la Caridad Cruz Alfonso was born on October 21, 1925 in the diverse, working-class neighborhood of Santos Suárez in Havana, Cuba, the second of four children. Her father, Simon Cruz, was a railroad stoker and her mother, Catalina Alfonso was a homemaker who took care of an extended family of fourteen. While growing up in Cuba's diverse 1930s musical climate, Cruz listened to many musicians who influenced her adult career, including Fernando Collazo, Abelardo Barroso, Pablo Quevedo and Arsenio Rodríguez. Despite her mother's opposition and the fact that she was Catholic, as a child Cruz learned santería songs from her neighbor who practiced santería. Cruz also later studied the words to Yoruba songs with colleague Mercedita Valdés (an Akpwon santería singer) from Cuba and made various recordings of this religious genre, even singing backup for other female akpwons like Candita Batista. As a teenager, her aunt took her and her cousin to cabarets to sing, but her father encouraged her to attend school in the hope she would become a teacher. However, one of her teachers told her that as an entertainer she could earn in one day what most Cuban teachers earned in a month. Cruz began singing at Havana's radio station Radio García Serra as a contestant on this station's popular "Hora del Té" daily broadcast, where she sang the tango "Nostalgias" and won a cake as first-place finisher. She often won cakes and also opportunities to participate in more contests. Her first recordings were made in 1948 in Venezuela. With Sonora Matancera, she appeared in cameos in some Mexican films such as Rincón Criollo (1950), Una gallega en La Habana (1955) and Amorcito Corazón (1961). When Fidel Castro assumed control of Cuba in 1959, Cruz and her husband, Pedro Knight, were prohibited from returning to their homeland and became citizens of the United States. In 1966, Cruz and Tito Puente began an association that would lead to eight albums for Tico Records. The albums were not as successful as expected. However, Puente and Cruz later joined the Vaya Records label. There, she joined accomplished pianist Larry Harlow and was soon headlining a concert at New York's Carnegie Hall. Celia in the Grammys 2002. Cruz's 1974 album with Johnny Pacheco, Celia y Johnny, was very successful, and Cruz soon found herself in a group named the Fania All-Stars, which was an ensemble of salsa musicians from every orchestra signed by the Fania label (owner of Vaya Records). With the Fania All-Stars, Cruz had the opportunity to visit England, France, Zaire (today's DR Congo), and to return to tour Latin America; her performance in Zaire is included in the film Soul Power. In the late 1970s, she participated in an Eastern Air Lines commercial in Puerto Rico, singing the catchy phrase ¡Esto sí es volar! (This is to truly fly!). In 1976, she participated in a documentary film Salsa about the Latin culture, along with figures like Dolores del Río and Willie Colón. 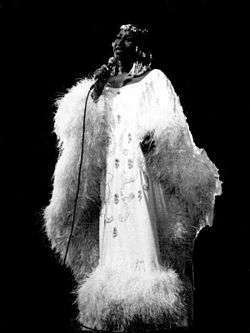 Celia Cruz used to sing the identifying spot for WQBA radio station in Miami, formerly known as "La Cubanísima": "I am the voice of Cuba, from this land, far away...I am liberty, I am WQBA, the most Cuban! (Yo soy de Cuba, la voz, desde esta tierra lejana...soy libertad, soy WQBA, Cubanísima!) During the 1980s, Cruz made many tours in Latin America and Europe, doing multiple concerts and television shows wherever she went, and singing both with younger stars and stars of her own era. She began a crossover of sorts, when she participated in the 1988 feature film Salsa alongside Robby Draco Rosa. In 1990, Cruz won a Grammy Award for Best Tropical Latin Performance – Ray Barretto & Celia Cruz – Ritmo en el Corazón. She later recorded an anniversary album with Sonora Matancera. In 1992, she starred with Armand Assante and Antonio Banderas in the film The Mambo Kings. In 1994, President Bill Clinton awarded Cruz the National Medal of Arts. In the same year, she was inducted into Billboards Latin Music Hall of Fame along with fellow Cuban musician Cachao López. In 1999, Cruz was inducted into the International Latin Music Hall of Fame in 1999. In 2001, she recorded a new album, on which Johnny Pacheco was one of the producers. 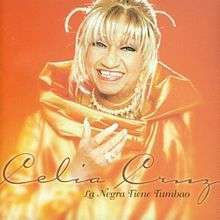 "La Negra Tiene Tumbao".One of Celia's most selling albums. On July 16, 2002, Cruz performed to a full house at the free outdoor performing arts festival Central Park SummerStage in New York City. During the performance she sang "Bemba Colora'." A live recording of this song was subsequently made available in 2005 on a commemorative CD honoring the festival's then 20-year history entitled, "Central Park SummerStage: Live from the Heart of the City". Cruz appeared on the Dionne Warwick albums 1998 Dionne Sings Dionne & 2006 My Friends & Me with their Latin Duet version of (Do You Know The Way To) San Jose. 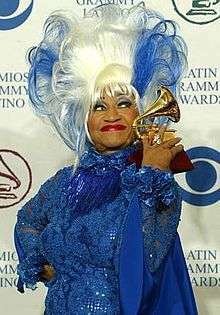 In March 2003, the Spanish-language television network Telemundo produced and aired a tribute special honoring Cruz, ¡Celia Cruz: Azúcar!. It was hosted by American singer Marc Anthony and Cuban-American singer Gloria Estefan. It featured musical performances by various Latin music and Anglo performers including Victor Manuelle, Paulina Rubio, José Feliciano, Milly Quezada, Los Tri-O, Estefan, Patti Labelle, Arturo Sandoval, Ana Gabriel, Gilberto Santa Rosa, Tito Nieves, Albita, Johnny Pacheco, Alicia Villareal, Olga Tañón, Mikey Perfecto, José Alberto "El Canario", Rosario, Luis Enrique, Anthony and Gloria Gaynor. 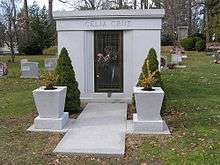 Celia Cruz's mausoleum in Woodlawn Cemetery, The Bronx, New York. On July 16, 2003, Cruz died of brain cancer at her home in Fort Lee, New Jersey, at the age of 77. Her husband, Pedro Knight (died February 3, 2007), was there for her while she was going through cancer treatments. She had no children with him. After her death, her body was taken to lie in state in Miami's Freedom Tower, where more than 200,000 fans paid their final respects. Multiple vigils occurred worldwide in cities such as Havana, Miami, and Cali (the Cali vigil became notorious in Colombian history due to its three-day span) Knight had Cruz buried in a granite mausoleum that he had built in Woodlawn Cemetery in The Bronx, New York City earlier in 2003, when she was dying. Knight chose the plot on which it stands, which is near the gravestones of Duke Ellington and Miles Davis because it was accessible to fans and had four windows built into it so that fans could see inside when paying their respects. Knight was known to share his time there with visiting fans. Knight himself was buried with Cruz in the same mausoleum following his death on February 3, 2007. An epilogue in her autobiography notes that, in accordance with her wishes, Cuban soil which she had saved from a visit to Guantánamo Bay was used in her entombment. In February 2004, her last album, Regalo del Alma, won a posthumous award at the Premios Lo Nuestro for best salsa release of the year. It was announced in December 2005 that a musical called Azucar! would open in Tenerife before touring the world. The name comes from Cruz's well-known catch phrase of "¡Azúcar!" On June 4, 2004, the heavily Cuban-American community of Union City, New Jersey heralded its annual Cuban Day Parade by dedicating its new Celia Cruz Park (also known as Celia Cruz Plaza), which features a sidewalk star in her honor, at 31st Street and Bergenline Avenue, with Cruz's widower, Pedro Knight, present. There are four other similar dedications to Cruz around the world. Cruz's star has expanded into Union City's "Walk of Fame", as new marble stars are added each spring to honor Latin entertainment and media personalities, such as merengue singer Joseíto Mateo, salsa singer La India, Cuban musician Israel "Cachao" Lopez, Cuban tenor Beny Moré, Tito Puente, Spanish language television news anchor Rafael Pineda, salsa pioneer Johnny Pacheco, singer/bandleader Gilberto Santa Rosa and music promoter Ralph Mercado. On May 18, 2005, the National Museum of American History, administered by the Smithsonian Institution and located in Washington, D.C., opened "¡Azúcar! ", an exhibit celebrating the life and music of Celia Cruz. The exhibit highlights important moments in Cruz's life and career through photographs, personal documents, costumes, videos, and music. On September 26, 2007, through May 25, 2008, Celia, a musical based on the life of Celia Cruz, played at the off-Broadway venue, New World Stages. Some performances were in Spanish and some in English. The show won four 2008 HOLA awards from the Hispanic Organization of Latin Actors. On March 16, 2011, Celia Cruz was honored by the United States Postal Service with a commemorative postage stamp. The Cruz stamp was one of a group of five stamps honoring Latin music greats, also including Selena, Tito Puente, Carmen Miranda, and Carlos Gardel. The Smithsonian’s National Museum of American History collaborated with photographer Robert Weingarten to create an object-based portrait of Celia Cruz featuring artifacts in the museum. The portrait was unveiled October 3, 2012. On October 21, 2013, Google honored her with a Google Doodle. At 41st American Music Awards, American singer Jennifer Lopez performed a medley of Cruz's songs. ↑ Pareles, Jon (December 14, 1992). "Review/Pop; The Queen of Latin Music Takes It From the Top". Retrieved January 27, 2014. ↑ "Celia Cruz's Shoes". National Museum of American History, Smithsonian Institution. Retrieved 2008-06-09. 1 2 "Her Life". National Museum of American History. Accessed October 7, 2012. ↑ Cobo, Leila (July 26, 2003). "Cuban Salsa Sensation Celia Cruz Dies At 77". AllBusiness.com. ↑ Celia Cruz; Ana Cristina Reymundo (2004). Celia: mi vida. Harper Collins. pp. 24, 74. ISBN 0-06-072606-7. ↑ "¡Azúcar! The Life and Music of Celia Cruz". Smithsonian Institution. Retrieved 2007-11-04. ↑ Celia Cruz; Ana Cristina Reymundo (2004). Celia: mi vida. Harper Collins. pp. 32–4. ISBN 0-06-072606-7. ↑ Scott, O.A. (2009-07-10). "Music and Musicians Still Echo 35 Years Later". The New York Times. ↑ Lannert, John (May 21, 1994). "First Latin Music Awards Recognize Range of Talent". Billboard. Nielsen Business Media, Inc. 106 (32): LM-52. Retrieved June 3, 2010. ↑ de Fontenay, Sounni (7 December 1998). "International Latin Music Hall of Fame". Latin American Rhythm Magazine. Retrieved 18 October 2014. ↑ Pareles, Jon (17 July 2003). "Celia Cruz, Petite Powerhouse of Latin Music, Dies at 77". The New York Times. The New York Times Company. Retrieved 17 June 2016. ↑ Pardillo, Omar (4 February 2003). "Telemundo to Produce Tribute Concert: ¡Celia Cruz: Azucar!". Celia Cruz Foundation. Retrieved 5 July 2016. ↑ Ellen Pearlman (April 1, 2008). "Azucar! Celia: The Life and Music of Celia Cruz at the New World Theater". The Brooklyn Rail. ↑ Townsend Rosa; Vicent, Manuel (July 18, 2003). "La muerte de Celia Cruz consterna al exilio cubano y a los artistas de la isla". EDICIONES EL PAÍS, S.L. Retrieved 24 July 2012. ↑ "¡Azúcar en el cielo!". El Diario de Hoy. July 17, 2003. ↑ "Azúcar: Google celebra a Celia Cruz" (in Spanish). Telemundo. October 21, 2013. Retrieved October 21, 2013. ↑ Brady, Emily (February 25, 2007). "Amid the Gravestones, a Final Love Song". The New York Times. ↑ Rosero, Jessica (June 2, 2004). "Homage to Celia Cruz: UC to pay tribute to Queen of Salsa with events, park dedication". The Hudson Reporter. ↑ Rosero, Jessica (June 18, 2006). "Viva la comunidad Cubano North Hudson celebrates at the annual Cuban Day Parade". The Hudson Reporter. ↑ Rosero, Jessica (May 26, 2006). "'La vida es un carnaval' North Hudson celebrates 6th annual Cuban Day Parade". The Hudson Reporter. ↑ "Jennifer Lopez rinde tributo a Celia Cruz en los American Music Awards". The Huffington Post (in Spanish). AOL. November 24, 2013. Retrieved November 25, 2013. Wikimedia Commons has media related to Celia Cruz. Celia Cruz collection, 1948–2008 at the Cuban Heritage Collection, University of Miami Libraries. This archival collection contains photographs, newspaper clippings, music scores, and a range of other materials documenting Cruz's professional activities. ¡Azúcar! The Life and Music of Celia Cruz at the National Museum of American History. Celia Cruz at the Internet Movie Database.